Jamaica’s Minister of Tourism and Entertainment, The Hon. Dr. Wykeham McNeill, this afternoon unveiled Jamaica’s exciting new brand identity in London at leading travel industry event World Travel Market 2013. 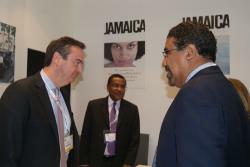 World Travel Market was chosen for the global trade launch of Jamaica’s new brand identity, ‘JAMAICA - Get All Right’, and replaces the previous brand campaign, ‘JAMAICA - Once you go you know’. The new JAMAICA - Get All Right brand identity was selected to help express Jamaica’s ‘edgy’ tone. For example, a JAMAICA - Get All Right image library has been launched to create a collection of photographs that encompass the excitement, enjoyment and relaxation of Jamaica across several categories. These include nature, culture, activities, food - and romance. The new branding will also run across other communications including digital, TV and print advertising. Elizabeth Fox, Regional Director for the Jamaica Tourist Board in UK and Northern Europe further explains the rationale behind the new branding; “Jamaica is more than just a holiday destination, it’s a feeling, it’s an experience. The world is realising that Jamaica has so much to offer – and so much more than other destinations. For this reason we thought it was time to refresh the way we market Jamaica. For further details on Jamaica visit www.VisitJamaica.com.